"What is the correct flag to be flown on land by civilians?" The oldest surviving Union Flag? The St George's flag with a St Andrew's flag in each quarter. In this bizarre design the white cross of the St Andrew's flag does not extend to the corners of the flag. As late as 1693, Slezer, Captain of Artillery and Surveyor-General of Stores and Magazines in Scotland, produced an engraving on Edinburgh Castle in which the 'Scottish' version is shown: again, an implication of actual use. Source: Paul Harris (ed. ), Story of Scotland's Flag, Lang Syne Publishers Ltd, 1992. Available from the Flag Research Center. The design of the Union Flag that preceded the current version was established by a royal proclamation of 12 April 1606. However it was for use only at sea in civil and military ships of both Scotland and England. In 1634 its use was restricted to the king's ships. The flag went out of use in 1649 when England became a commonwealth but was restored for use in the king's ships after the restoration in 1660. The flag became 'the ensign armorial of the United Kingdom of Great Britain' as one of the provisions of the Act of Union in 1707, when the kingdoms of England and Scotland were united. According to Hulme, "The Flags of the World" (1896), p. 46: http://en.wikisource.org/wiki/The_Flags_of_the_World there was another proposal, with white Scottish saltire, fimbriated blue, placed over the red English cross on white field. In Hulme's opinion, this variant was probably rejected because "here we get false heraldry, the blue in contact with the red, and in any case a rather weak-looking arrangement". Note that the legend for this illustration is erroneous: "Scotch suggestion for Union Flag, 1801. ", as is the legend for the variant which was used: "Suggested Form[s] for second Union Jack." Another variant seems to have been in use, with the Scottish saltire in blue superimposed over the red English cross on white field. It is shown on a ceiling boss from Linlithgow Palace, currently exhibited in the National Museum of Scotland, which depicts the Scottish royal unicorn (heavily damaged - the head no longer exists) holding a flag with this design. The original paints of the flag have been rather paled by age, and even seem to have been peeled off in some places, but are still recognizable, and seem to reveal that there was no white fimbriation between blue and red. The boss is dated c. 1617, not long after the original Union Jack was adopted, and clearly suggests that the Scottish variants of the flag, this one at least, might have had some official use, since this depiction of it comes from a royal palace. This one-off example shows it to have been unique and indicates the chance of the artist's ignorance. That may have been the case. On the other hand, there is the variant given by Hulme which has some resemblance to this one. Unfortunately, we currently don't know Hulme's sources. And I think that we should not forget similar flags from the cartoons by James Gillray although these display English cross over the Scottish saltire and at least some of them are certainly erroneous. All of these varying designs, which still strikingly resemble each other, probably did not just come out of nowhere. Here is the relevant part of the Wikipedia image. I'm not sure what to say. It looks like the orthogonal cross has been removed completely, be it by time or human hand. Where the shape left behind shows most clearly, it does looks like there is some sort of fimbriation to the blue. Although the red color is indeed less preserved than blue, there still seems be left some. And the parts which might look like a white fimbriation, also look like the result of damage, and in the other parts, blue and red are contiguous. I forgot to add that the flag is actually a painted bas-relief, the areas in different colors also having different elevations, which helps in recognizing the orthogonal cross even there where is very little color left, if any. I would see there's no red left at all. What we see is the building material (dark), an undercoat (pale) or two, and the blue and white paints. The shadows along the edges show what is deeper and what is higher. I find it a bit suspect that the red disappeared so completely. Either it was of poor quality, or its disappearance was assisted. Maybe some reddish wood was intentionally chosen? Either is possible, although I'd still opt for the first variant - after all, Scottish symbol was placed over the English one, which might be enough to make a number of potential removers give up. Also note that the hoist arm of red(dish) cross is not completely separated from blue saltire by what resembles a white fimbriation - there is a small part where two areas are contiguous. Cross as the basis of their colours, whereas Scottish Regiments could not use the St. Andrew's Cross. As a matter of interest, the 'impaled' design was actually used (from c1643) as a jack by Royalist ships in the English Civil War. 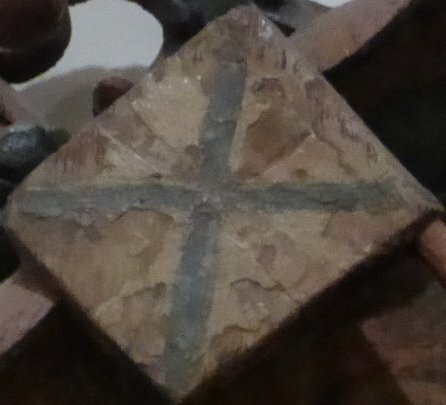 Another design not shown had a quarterly arrangement - Cross of St George first and fourth, Cross of St Andrew second and third - and this is known to have been used as a jack on at least one occasion (1623). 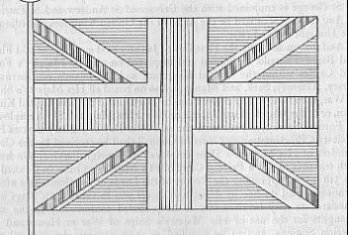 A drawing of the Union Flag that was sent to the Office of Stores for the Navy Board, on 15 November 1800 was marked, 'Union Flag from 1st January 1801 (c)', but the fimbriation had been made by reducing the width of the red diagonal. The drawing, as reproduced in the Mariner's Mirror (Journal of the Society for Nautical Research), is shown here. It was found among a collection of drawings and letters from the office that organised flags for the Navy. The collection of correspondence was closed in 1837 and apparently retained in the Secretary of the Admiralty's Office until 1949, when it was handed to the Admiralty Library. It is unlikely that it was ever seen by William G. Perrin. Commander Hilary P. Mead R.N. described it in two articles in the Mariner's Mirror, April 1951 and February 1952. He commented that the drawing, "differed somewhat from that in Perrin's plate IV." I wonder if the change was made by accident or design? "Admiralty Office, 15 November 1800. And that on and after the First Day of January next ensuing the said Flags and Banners should be hoisted and displayed on all His Majesty's Forts and Castles within the United Kingdom, and the Islands of Guernsey, Jersey, Alderney, Sark, and Man, and also on board all His Majesty's Ships of War, then lying in any of the Ports or Harbours of the said United Kingdom, or of the Islands aforesaid, and on board His Majesty's Ships employed on Foreign Service, as soon after the said First Day of January next as His Majesty's Proclamation or Order in Council shall be received by the Commanders of His Majesty's Ships employed on Foreign Service; We herewith transmit to you a Printed Copy of His Majesty's Order in Council of the 5th instant approving the Report of the Lords of the Committee afore-mentioned, and do hereby desire and direct you to cause such Flags and Standards as may be necessary to be prepared conformably to the said Draughts for the use of His Majesty's Ships of War at Home and on Foreign Stations, and to be supplied with them accordingly, with all the dispatch that may be. Arden, J.Gambier, W.Young. Navy Board." Note by John David Rolt, chief clerk in the Office for Stores, the Navy Board. Memorandum ( to C ). "The Ensign is Red, White and Blue according to the Colours of the Admiral's Flag, who bears it, with this Union Jack in a Canton in the Upper or Chief Dexter corner, and next the staff." Mead notes; "The Union Flag is from 24 to 18 breadths and is allowed to Flag Ships only. The Jack is the same in all respects except in sizes, which are from 10 breadths downwards. The Admiralty version of the Union Flag, shown above, is, in fact, a corruption of the herald's original intention. In the Admiralty version (still of course in use today) fimbriation to the saltire of St Patrick is created by taking it from the saltire itself instead of from the field, whereas, according to the original design the saltires of St Andrew and St Patrick should be of equal width with a fimbriation added. The colour illustration (preserved in the Privy Council papers) and blazon supplied by Sir Isaac Heard (Garter King-at-Arms) was - in accordance with Article One of the Act of Union between Great Britain and Ireland - approved by the King in an Order in Council of 5 November 1800. The Act of Union was then proclaimed in London Gazette No. 15324 dated 1 January 1801, with the blazon (accompanied by a monochrome drawing) reading as follows: "...that the Union Flag shall be azure, the Crosses Saltires of St Andrew and St Patrick Quarterly per Saltire, counterchanged Argent and Gules; the latter fimbriated of the Second surmounted by the Cross of St George of the Third, fimbriated as the Saltire". Which brings me to the Great Union of 1900. In preparing a design for the War Office the College of Heralds returned to the original blazon and correctly made the saltires of even width with a fimbriation added, however, whilst it is obvious from the 18th Century illustration that the phrase "fimbriated as the saltire" was intended to mean 'fimbriated in the same colour as the saltire', the late-Victorian heralds wrongly interpreted this as meaning of 'the same *width and* colour'. I checked some documents that might have had information about the introduction of the new Union Jack in 1801. The Captains Logs from ten RN ships in commission on 1 January 1801, selected at random, produced three references to the occasion. Blanche in Portsmouth "hoisted the (something, possibly 'union') colour", Phoebe in Cork "fired salute of 21 guns to celebrate union between Great Britain and Ireland" and Agincourt at Spithead did the same, though a day later on 2nd of January. "Caution to Masters of Merchant Vessels Against Wearing Unlawful Colours. By the King a Proclamation, First Day of January 1801." It included a small drawing of the Red Ensign in black and white with the colours indicated by words. The width of the diagonal stripes was in proportions 1-2-3, arranged with the wider white stripe uppermost not only in the first and third quarters, but also in the second and fourth quarters. The introduction of the present Union Jack appears to have been more complicated than the usual accounts suggest. It obviously depended upon the Union actually taking place, and this required the assent of both British and Irish parliaments, but in December 1799 the Bill was rejected by the Irish parliament. It was re-introduced in the New Year and finally passed its Third Reading on 7 June 1800. I do not know if the corresponding Bill had already been passed by the British parliament, or whether it was done shortly afterwards. It received the Royal Assent on 2 July 1800, (40 Geo. III c. 67). The article in the Act relating to the flag stated; "That it be the first Article of the Union of the Kingdoms of Great Britain and Ireland, .... that the ensigns, armorial flags and banners thereof shall be such as His Majesty, by his royal Proclamation under the Great Seal of the United Kingdom, shall be pleased to appoint." However it appears that the flag had already been designed, and some examples made. On the following day, 3 July, the Duke of Portland, Home Secretary, wrote to Viscount Castlereagh, Chief Irish Secretary ending, "... and, as to the new Union Flag, that, though ready, was not hoisted, because we found out that we have no right to use it until the first of next year, when the Union takes place." http://www.actofunion.ac.uk/castlereaghindex.php?volume=3 Documents 352/353. Perhaps it had been intended that the Union should take place on the first day of the new century ? The Order in Council of 5th November 1800 seems to have been a formality. Whether the Union Jack is an "official national flag" depends upon ones interpretation of the phrase. It is the official royal flag of a monarchy, and thus the kingdom's national flag, but its use by private individuals or bodies has been sanctioned by parliamentary statements, not by legislation. 22 October 1902. Mr Balfour, First Lord of the Treasury. The questions which have been raised as to the proper use of flags have received careful consideration by the Government, but they are unable to adopt the course of action suggested. Nor does it appear desirable to undertake the legislation that would be necessary in order to regulate the general use by civilians, or any class of civilians, of any particular flag on land. It is a matter which is best left, as hitherto, to the guidance of custom and good taste. [By way of further explanation, the First Lord of the Treasury is one of the other offices of the Prime Minister of the United Kingdom - and in fact is written on his letterbox at his office at 10 Downing Street, London. This would indicate the high level at which this matter was being deliberated at that time. Source: Web site of the British Prime Minister, http://www.10downingstreet.gov.uk, consulted 12 June 2006. 9 May 1912. Colonel M'Calmont. To ask Prime Minister whether the Union Jack is the emblem of the nation rather than the sovereign, and if this is so, in the event of the Government of Ireland Bill becoming law, will it be competent for the Irish Parliament to eliminate the cross of St Patrick from the national flag. Mr. Asquith. The Union Jack was established by Royal Proclamation under the Act of Union and is as much a matter of prerogative as the Royal Standard. What is the correct Flag to be flown on land by Civilians? "There is no Flag in existence answering to this general description. Civilians generally are not authorised to fly or display any Flag. Peers and gentlemen entitled to bear Arms have a right to fly from their Castles or residences a banner of their Arms. The Royal Standard appertains to the Sovereign alone. The Union Flag of the United Kingdom is used by authority throughout the Army and Navy, and the State Departments, usually with some modification or addition by way of distinction. The Union Flag, being the National Flag, appertains to the Nation as a whole, and cannot be considered as specially distinctive of individuals, or groups of individuals. The common practice on occasions of national rejoicing of displaying the Royal Standard and the Union Flag indiscriminately with other Flags must be regarded as an attempt to express loyalty by means of decoration. As to Public Buildings, Schools, etc - State Buildings should fly the Union Flag. Schools etc., should fly the Flag displaying their proper Arms. Municipal Buildings should fly a banner of the Arms of the particular Corporate body. The issue of a Royal Warrant touching this matter would, in my opinion, be inexpedient. There appears to be no such thing as a "correct" flag for use by civilians on land. It seems that any one who has a coat of arms may display them on a flag, and the Union Flag has been used without restraint. A warrant under the Act of Union can be and has been issued fixing the ensigns, ceremonial flags and banners of the United Kingdom, but this warrant does not relate to such flags as private people may fly. The Union flag has been used indiscriminately for a very long period. There is no power by law to interfere with the use on land of any flag even the King's Standard. Any such warrant as proposed would therefore be accompanied by no means of enforcing it. There seems no reason why the state should intervene as to flying flags on land, (except as regards the King's Standard). To attempt to enforce any rule would bring the state into conflict with Trades Unions, the Royal Order of Ancient Buffaloes, the Foresters, and for all we know the processions of the Roman Catholics and Ritualists (etc). In fact it is impossible to say where it would end. To lay it down that all schools should use, say the Union Jack, would at once provoke a number of schools in Ireland to display a green flag with a harp, or a sunburst, the Socialists to display red banners. Is the state then to interfere and compel them all to use the Union Jack only ? Such an attempt would I think raise a veritable hornet's nest. The true answer is I think, that "there is no 'correct flag' for use on land except the Royal Standard by the King, and possibly coats of arms by those who possess them. There is no power at law to enforce the use of any flag. The use of flags on land has been regulated only by custom and good taste."